Last Friday marked the anniversary of the first moon landing, which took place on July 20 1969. 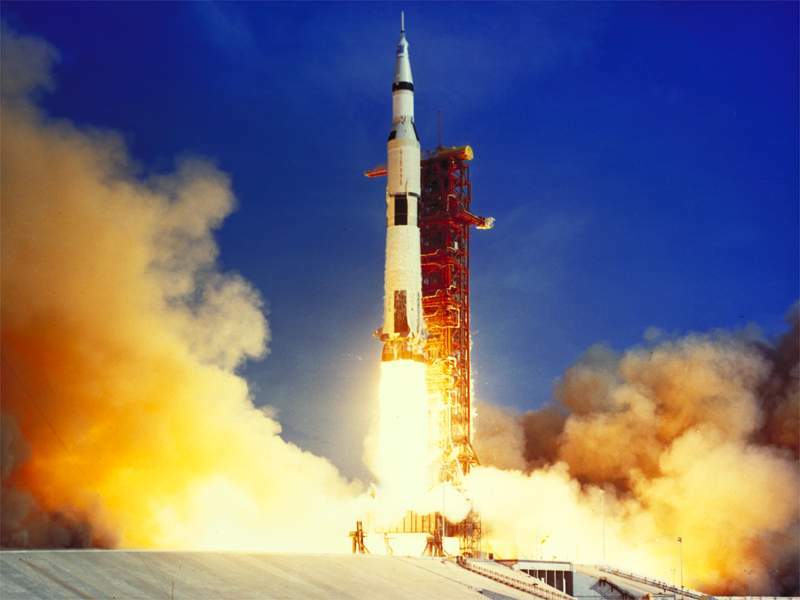 The NASA spaceflight programme responsible was famously named Apollo, and the name was chosen in 1960, during the administration of President Eisenhower. It was named after the Greek god of the sun by NASA manager Abe Silverstein, and he later said that he named it as carefully as if he was naming his baby. Dr Silverstein had been reading a book of Greek mythology, and was struck by an illustration of the god Apollo riding his chariot across the sun; this seemed in line with the grand scale of the project they had in mind. It became far grander after the election of President John F. Kennedy, for while Eisenhower was on the fence about the whole space thing, Kennedy had made winning the Space Race against the Soviet Union a key campaign promise. Like many people on their way to power, President Kennedy hadn’t considered how much such a promise would cost, and when he found out the price, he also started to go a bit lukewarm on the idea. Once the Soviet Union became the first to send a man (cosmonaut Yuri Gargarin) into space in 1961, it all suddenly seemed a lot more pressing, and President Kennedy vowed that the United States must be the first nation to land a man on the moon, and would do so by the end of the decade. Even some people at NASA thought this was going a bit far, and wondered if the President understood how difficult it would be. No he didn’t, but that’s what leaders are for – to come up with big impossible dreams, and then let the brainiacs sort out the technical details. As we all know, they did manage to get to the moon by the end of the 1960s, on spaceflight Apollo 11, and history was made – not just American history, but world history. Around the globe, 500 million people watched the moon landing on their TV sets, and Australia played a vital role in the television broadcast of the moon landing. The images broadcast from the moon were received by three tracking antennae – one in California, one in the delightfully named Honeysuckle Creek near Canberra, and one in Parkes, New South Wales. The very first television pictures were received by Honeysuckle Creek, and then NASA alternated between California and Parkes, trying to find the best quality pictures. Less than ten minutes into the broadcast, the signals from Parkes were so superior that NASA stayed with them for the rest of the two-and-a-half hour television broadcast. The behind-the-scenes of the television broadcast seems to have been very confused. One of the biggest mysteries to me is how NASA managed to lose all the footage we sent them. They didn’t throw them in a cupboard and forget about them, they actually taped over them. I mean, this isn’t the family holiday to Fiji we’re talking about, it’s the freaking moon landing! With baffling carelessness, they also lost the back-up copy Australia sent them. After an exhaustive search, a bootleg copy of the original broadcast was found in Australia in time for the fortieth anniversary of the moon landing. Phew! The god Apollo who had inspired the name of the space programme was one of the most important and complex in the Greek and Roman pantheon. Always depicted as a handsome and gloriously athletic young man, he was the god of many things – light, the sun, prophecy, healing, music and poetry amongst them. I think of him as a very appropriate god for Australia, because (apart from all the sunshine he’s blessed us with), he was also a god who ruled colonists, and protected flocks and herds. As a former colony with a strong interest in farming, it’s a wonder we don’t celebrate him more often in official imagery. His name is so ancient that the meaning of it is now very obscure. The Greeks themselves tried to link the name to Greek words that sounded similar such as those for “destroy”, “redeem”, “purification”, “simple” and “ever-shooting”. The name was connected to the word apella, meaning “assembly”; the Apella was a Spartan political meeting held on each full moon, aptly enough. This word originally meant “a wall, a fence”, so you can see that the Greeks saw the political process as being protected by the god, just as he protected flocks of animals. Apollo’s earliest role seems to have been as a protector against evil. The name is likely to be older than Greek, as there are a number of gods from the Middle East with similar-sounding names. The official title of the Babylonian sun god Nergal was Aplu Enlil, meaning “son of Enlil”. Enlil means “lord of the storm”, and he was the chief god of the Sumerians. Not only does Aplu sound like Apollo, but the parallels between chief storm gods Enlil and Zeus, and their sons, sun gods Nergal and Apollo are obvious. If so, the name Apollo simply means “the son of”, like the Gaelic prefix Mac. The meaning is far less important than what it symbolises, for classical Greece made Apollo the principle of light, harmony, order and reason. This is the Apollo who presided over contests of music, art and literature, and who inspired the greatest composers and poets. But he had a darker side too from his Eastern origins, which were shamanistic and oracular. His Delphic priestesses sometimes perished in their efforts to hear his divine voice, people who died suddenly were said to have been struck down by the god, and he also brought plague and pestilence as a mark of his displeasure. He demonstrates that everything being light, bright, clear and intellectual are not enough – we also need intuition, awe and mystery in our psychological make-up. Apart from the god and the space programme, the name may remind you of fictional characters Apollo Creed, from the Rocky movies, and Captain Apollo from Battlestar Galactica. A famous example of a real life Apollo from our own region is the Samoan-New Zealand rugby player Apollo Perelini, a relative of Australian soccer star Tim Cahill. Perelini got his name because he was born the day the Apollo 11 space project was launched – July 16 1969. His middle name is 11. An Australian link is the tourist town of Apollo Bay on the Victorian coast, so named because the ship Apollo sheltered from a storm there. Apollo is a strong, handsome and spectacular name which commands attention. It’s garnering some interest and perhaps greater use, as it fits in with the trends for mythological names and names ending in O. I suspect this might be a name where many people love the sound and associations, but fear that calling their son after such a divine figure may seem a little hubristic. If so, it makes a brilliant middle name. Many parents are becoming a bit more daring with boy’s names, and if you prefer names without a built-in nickname, Apollo is one to consider. Apollo makes me think of Apollo Ono, the speed skater. His name is actually Apolo Ohno.